Exhausted, a piece I completed and released into the world on July 16, 2012. 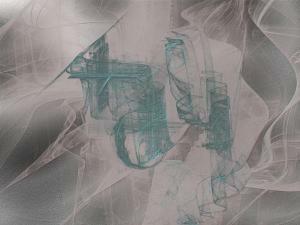 One of my first abstract digital fractal manipulations, it is a piece in green and gray, with texture in both the foreground of the fractal used and in the background to mimic the look of real paint on canvas. The piece began as a fractal rendered with Apophysis, then brought into Gimp for post processing. The title of the piece, Exhausted, is of unknown origin, but was probably how I was feeling at the time after trying several different digital techniques to bring a flat fractal to life and give it dimension. As it was one of the first fractal manipulations I had attempted I was still discovering what was possible. If you have any thoughts or feelings about the piece, drop me a line! 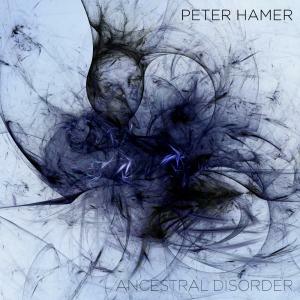 Peter Hamer is about to release a new album entitled "Ancestral Disorder" and has selected on of my pieces, "Happy Days" (https://fineartamerica.com/featured/happy-days-jeff-iverson.html) for the cover art. A link to the official album teaser trailer is included (https://www.youtube.com/watch?v=-PaOToMU7q4), as well as the final version of the album cover. Peter Hamer is based in Turin, Italy and is a soundtrack composer for movies, trailers, commercials and tv series. It was a real pleasure to work with him on this project!